Somewhere down the line I’m sure you’ve thought of starting a business. But before you even figured out what type of business you wanted, those sneaky thoughts got to you. “Oh, I wouldn’t even know where to begin,” or “Even if I had the funds, I wouldn’t know how to gain revenue.” This is where the University of Missouri–St. Louis Accelerate program comes into play. The Accelerate certificate helps you learn everything you need to know for entrepreneurship. The program advances your education with expertise, mentorship, and experiences. You get to attend a curriculum that fits into your heavy schedule. With classes like Intro to Entrepreneurship, Principles of Social Entrepreneurship, Experiential Entrepreneurship, and Small Business Management you will be able to learn the ins-and-outs of business ownership. You also get to learn real-world experiences by taking the Accelerate Capstone. “UMSL Accelerate Capstone experience combines cutting-edge theories of entrepreneurship and innovation with the real-world experiences needed to take an idea from concept to investable startup or new corporate division,” according to UMSL Accelerate. Each class teaches different, important lessons in making your own business. In Intro to Entrepreneurship, you’ll be introduced to the important skills, perspectives and theories any successful entrepreneur needs. In Principles of Social Entrepreneurship, you’re taught how to differentiate yourself from other entrepreneurs in your field, as well as how to create a financially stable business. Experiential Entrepreneurship has students working side by side with experienced entrepreneurs for a hands-on experience. Finally, in Small Business Management, you’re taught how to solve the problems your business might face certain techniques in order to help it grow. With these skills you’ll be able to create and run your own business! Recent UMSL Accelerate graduate Patrick Davis, started his own company IllLumenEssence. He was able to do it with the courses and guidance offered through the UMSL Accelerate program. His business, IllLumenEssence, is a mobile company that focuses on custom automotive lighting and installation. Davis learned the skills to manage and grow his business and you can, too! “I didn’t think that I could start a business by myself… Every step of the way [Accelerate] allows you to have mentors and access to the professors outside of class time and they are coaching you through the process,” said Davis. Davis got involved with the program when one of his professors noticed the progress he was making during his Intro to Entrepreneurship course. “[Davis’ professor] said it would be a great way to move forward and get advice from the people involved with the Accelerate program,” said Davis. IllLumenEssence started as an idea and has now been running business for over three months. Davis’ custom automotive lighting business has taken off since the UMSL Accelerate program. UMSL Accelerate gave Davis the skills and resources he needed to take it to the next level. UMSL Accelerate offers you everything you will need! This one of the most beneficial aspects of the program. On top of the guidance from staff, Davis explained that he was able to collaborate with other students and find ways to benefit each other despite having two completely different businesses. 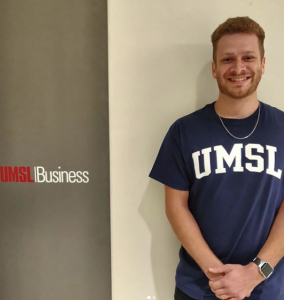 Davis was also paired with mentors all throughout his education in UMSL Accelerate and they were also able to help him with his other venture: Entrepreneur Quest Student Accelerator (EQ). The EQ Student Accelerator is basically an eight-week education program for the top 10 semifinalists from UMSL with dedicated workspace and mentorship from executives, industry leaders, investors, and experts. Not only are you able to learn more through this program, but you can also compete for up to $30,000 to put toward your business! “You’re given a mentor, you’re given subject matter experts, you’re given all of the professors in [UMSL Accelerate], and Dan Lauer, who’s one of the heads of the department and they help you,” said Davis. The competition started off with 50+ applicants from each UM System university, including Davis, who signed up back in November of last year for the EQ program. During last semester, those applicants were filtered down into 15 people from each university. This part of the competition is considered the “Shark Tank.” The “Shark Tank” then narrowed the competition further, ending up with the top 10 finalists from each university. After the second pitch, three winners from each university will be announced and given funds of $15,000, $10,000 and $5,000. Then they will be sent on to the EQ Champion round. This event is going to be held in Columbia, Missouri on April 4 and judges will decide the top three winners out of all the UM System and announce them on April 5. First place will be awarded $15,000, second place gets $10,000 and the hird will be given $5,000. This is CASH MONEY that could be put toward your future business! Sound good? Students like you, who are interested in starting a business, will be able to sign up for the 2019 EQ program this fall through the EQ Student Accelerator website. As long as you are actively enrolled, an undergraduate, graduate or a professional student, according to UMSL Accelerate, you will be eligible for application. Have any questions about UMSL Accelerate or the EQ Student Accelerator? Interested in learning more? Check out the UMSL Accelerate website and learn to have confidence in yourself like Patrick Davis did!